FROM HIGH IN HIS PERCH, HAWK WAITED FOR A CHANCE. IN THE GARDEN BELOW, A MOVEMENT CAUGHT HIS EYE. DOWN HE SPED. A hungry hawk has staked out a vegetable garden. No, he's not stalking the wild asparagus. There's bound to be a rabbit there sooner or later, he figures, and that means dinner! With a rabbit finally in his sights, Hawk dives, thrusts out his talons, shrieks a cry of victory, and soars back to his nest, ready to do the raptor captor thing. In his talons is a super-sized carrot. His prey, a plump and tender rabbit toodling to his hole with a barrow full of veggies, has grabbed the nearest garden product and used it for a hawk shield. Hawk leaves the carrot and returns to his perch for another try. Ah, here comes that wascally wabbit waddling wight by with his wee wittle wheelbarrow. Hawk pulls up from his dive to discover his claws grasping--a cucumber? A cuke fluke? OH, COME ON! I JUST HUNTED A HEAD OF LETTUCE? As the saying goes, when life gives you lemons, you make lemonade. And when Hawk winds up with a nest full of potential side dishes, is he gonna make a salad? 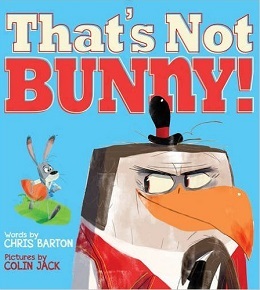 It's a veritable vegetarian day for this raptor in Chris Barton's newest, That's Not Bunny! (Disney Hyperion, 2016). Barton's old-fashioned comic characters have the retro look and sound of 1960s Saturday morning cartoons that will tickle young readers' funny-bunny bones. "Perfect for reading aloud, this is a great addition to picture book collections," says School Library Journal. Chris Barton is also the author-illustrator of the top-selling Shark vs. Train (read my review here).